I grew up in West Virginia. Not a lot of sailing there. But we did live a block from the Kanawha River and I learned early on that I felt more settled sitting by the flowing water watching the barges go by. I rode my bike along the banks of the river for countless hours growing up. I suppose I was more drawn to the water than I recognized. By 2006, my sailing experience was limited to a couple of day sails. In a “previous life,” my in-laws had a sailboat that they kept not far from where we lived in Ocean City, NJ. On those rare occasions that we would go out, it consisted of my father-in-law yelling orders at my husband in an exasperated tone. And every time a nice puff of wind would fill the sails and the boat would start to really sail and, therefore, heel just a bit, my mother-in-law would panic and scream “Make it stop!! Make it stop!” And before the day was done my husband would toss his cookies. So my sailing experience was pretty limited and unenjoyable. When Frank and I began seeing each other, he suggested our first major vacation should be chartering a sailboat in the British Virgin Islands – just the two of us. Talk about taking some seriously inexperienced crew!! It was a running joke that he was a water boy and I was mountain girl. 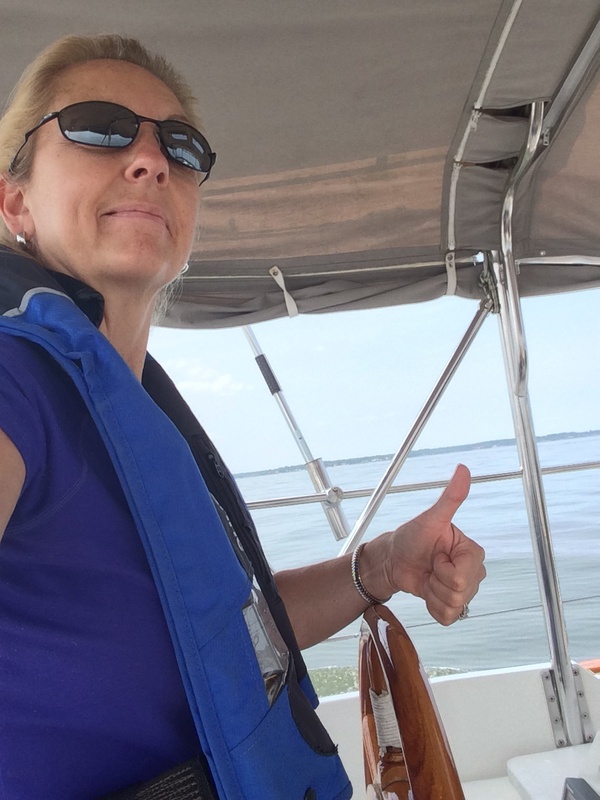 And yet, that first vacation together was the clincher for me – in spite of the rough conditions we hit on that trip, I was hooked on sailing. 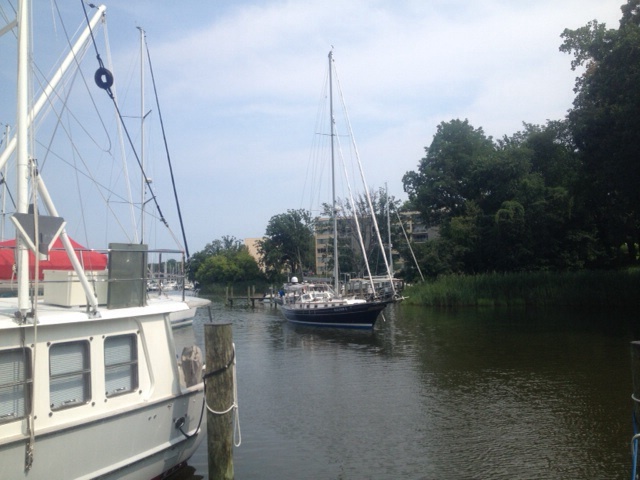 The first time I laid eyes on Annapolis was when I went there for my first sailing class – without Frank. 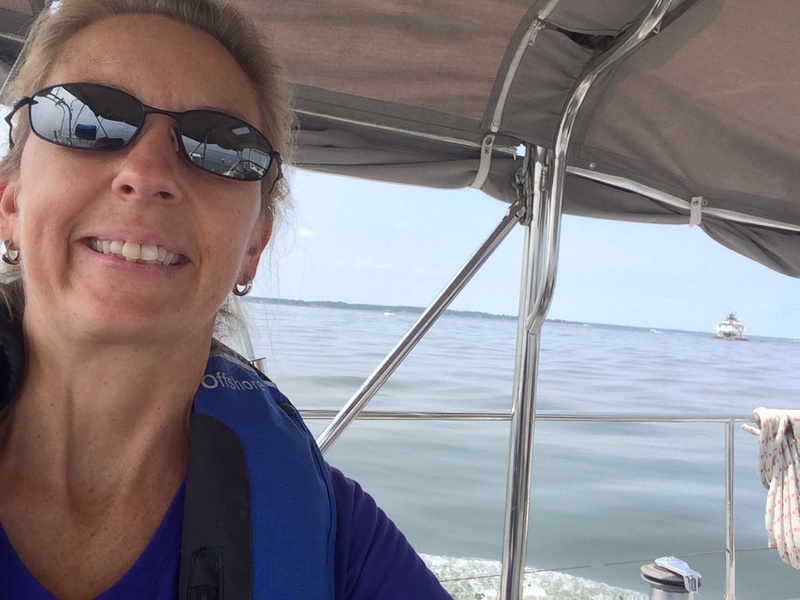 As we started talking about making sailing a more serious part of our life, he needed me to know for sure that I loved it because I loved it, not because HE loved it. He needed to feel confident that I would consider moving onto a sailboat with him because I wanted to as much as he did. He was quite wise in asserting that, if I went cruising with him for an extended period of time without being there for myself, I would end up hating it and resenting him. That was some pretty smart thinking. What we didn’t know was that he was creating a monster. I think a good monster, but I just haven’t been able to get enough of this learning to be a good sailor stuff. Fast forward to this spring. We have 4000+ miles under our belts. I’ve taken my fair share of shifts at the helm every day that we’re out. I’ve done hours overnight while he’s slept. I’ve been at this for a while now. I’ve finally gotten to the point where I don’t feel that I’m about to lose my lunch when I know I’m going to be docking the boat. I even started having the occasional dream where I’m taking the boat out by myself. I’m not looking to push him overboard or anything so don’t read too much into that statement. I’m just enjoying feeling more capable all the time. So last month when we planned to take the boat in for a bottom paint job, we had to plan the logistics of taking the boat to the marina. The place was about a 30 minute car ride from our slip in Annapolis but about a 2.5 hour boat trip down the bay to the West River. Just like when you take your car in for service, you have to figure out the logistics of dropping it off, right? So when I asked Frank how we were going to manage this, he said, “Well, you push me off of the dock (in the boat) and I’ll drive the boat over alone and you drive the car over and meet me.” So just to be funny (sort of) I said, “How about if you push ME off of the dock and I’ll take the boat over.” And to my surprise he said, “Okay.” I wasn’t quite expecting that! Later that night I brought it up again. He said he was in full support if I wanted to take the boat, but we talked through whether I was really ready for a solo trip. The plan we ended up with was a better one – still a big step for me, but a smarter one. Frank would take the boat over, but I would bring it back. 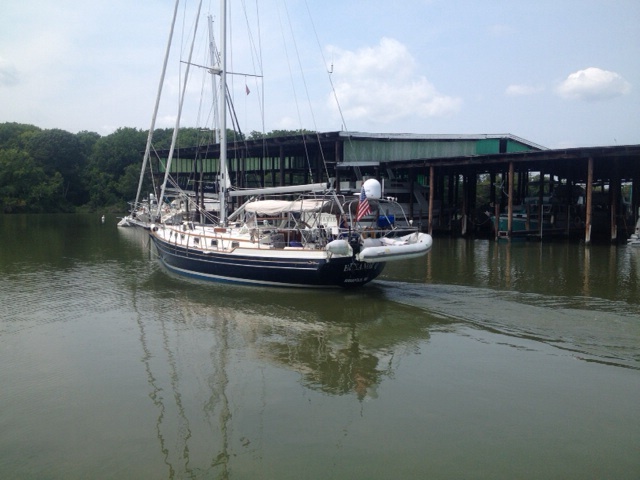 For me to try to dock by myself at a marina I knew nothing about and had never seen didn’t seem to make the most sense for my maiden solo trip; HOWEVER, pulling the boat OUT of that marina, going the 2.5 hours back up the bay and into Back Creek and into the slip I’m familiar with by myself . . . now that seemed more plausible. STILL . . . it was a plan for me to drive the boat alone!! Gulp! I was pretty excited over the prospect and Frank was excited for me and very encouraging of it. (I think some of our friends were shocked that he’d let me out of his sight in our precious Eleanor Q!) He had complete confidence. We planned this for weeks! As the day approached, I’d wake up thinking about it, sometimes in a bit of a cold sweat. But there was no turning back now. Come on – what’s the big deal. I was going to motor, not sail. I’ve been behind the wheel for that trip before when we had visited the West River. I’ve navigated up the bay from various points many times. 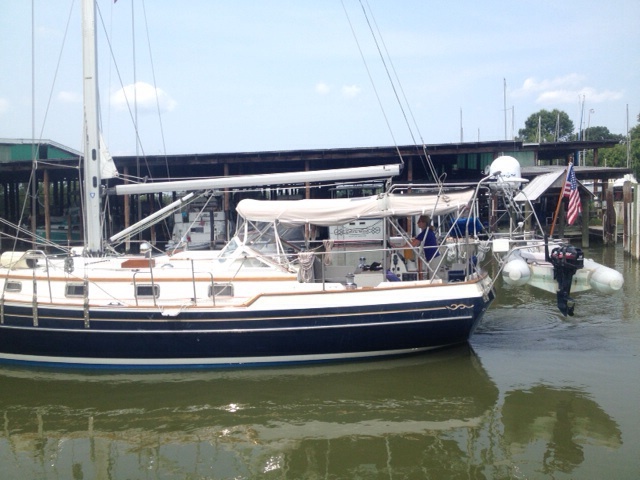 I had docked the boat the last three times that we came in without incident and without coaching. There wasn’t ANYTHING in that day that I hadn’t done before . . . I just hadn’t done it without Frank standing there. So the day came. We got up and left New Jersey, drove the three hours to Annapolis area and went to the marina where the boat was waiting in a slip for us. It was a large slip with lots of space behind it. I could quickly see that backing out of it would be no problem. So we readied the boat, took most of the lines off, talked about a couple of logistics, and Frank threw off the last line and waved goodbye to me! And started taking pictures of my big day. Heading out of the river. And so, Ems’ excellent day began. There were just enough challenges to make it interesting, but nothing to make it too unnerving . . . the weather was calm and beautiful, I had a route on the chart plotter to follow, I was aware of the tanker coming up the bay and kept an eye on his progress on the AIS to know how to stay out of his way. There were enough other boats out that day to navigate around. 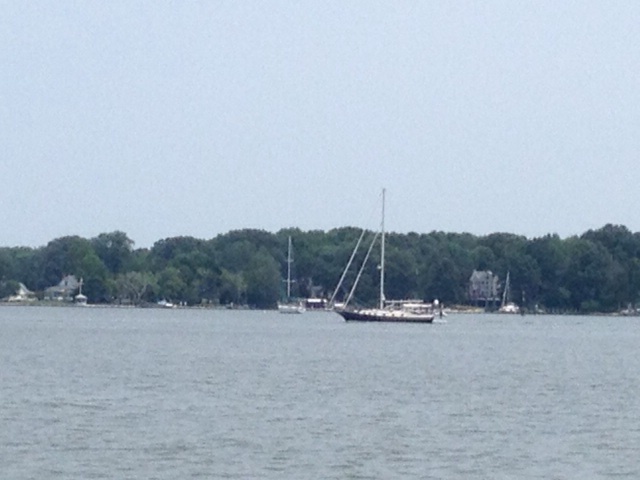 It was Friday afternoon in the summer in Annapolis – there are going to be boats – but it was still early enough in the day that traffic was not too bad. I texted Frank quickly (and safely) to let him know when I was getting close. It was so strange not to have someone there to ask, “Hey, what do you think that boat over there is doing? Or, “Do I need to change course for that fishing boat?” No one there to bounce that stuff off of . . . just me to figure it out and deal with it. Quick selfie with me and Thomas Point Light. I’ve got this . . . Shot this picture to Frank underway to let him know things were A-OK.
To some life long nautical people, that trip probably sounds like a no-brainer day. To this mountain girl who remembers the moment we were shopping for the boat and I stepped behind the wheel and thought, “That looks like a really long way to the tip of the bow . . . how do you ever get comfortable handling this thing,” I know how far I’ve come. I remember that feeling like it was yesterday. If I were a girl scout, I would have earned some kind of badge for the day. How cool is it when we can still find moments in life that push us outside of our comfort zone and we can feel like we really did master something we never thought we could? This was a big step for me, and it wasn’t just in my dreams. A most excellent day, indeed. Nailed it, of course! Bravo Zulu. Wonder what the latest is from you guys! When we get back to NJ this fall, can we get together? Excellent day, indeed, EMs!! You rock! So well-written! I’m right there along side of you! Big congrats, water sister!